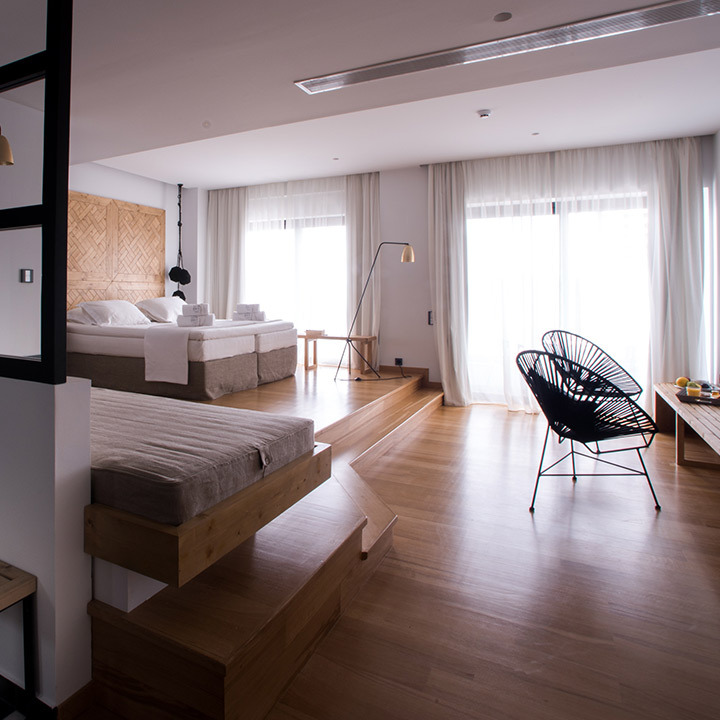 Situated in an elegantly restored, modernized and minimalistic property in Nea Stira, Southern Evia, Sunday Hotel is easily accessible from the center of Athens and Eleftherios Venizelos international airport via a short car and a 45-minute boat ride initiating visitors to the majestic waters of the Evian Sea. Emphasizing on comfort, luxury and clean-cut design, all 15 rooms offer boutique style accommodation, refined services and deluxe amenities underlined by a delightful beach-front setting. Each room is designed with an individual personality focused on bringing a relaxed feeling via ingenious and lavish aesthetics. After sunbathing and exploring Sunday Hotel’s boat services during a day at the crystal blue waters on the front beach, guests can unwind and taste Mediterranean style cuisine in Sunday Hotel’s stylish ground floor restaurant or savor the glorious sunset while having cocktails and drinks at the rooftop terrace. Our accommodation and facilities welcome and discreetly remain at the disposal of guests ensuring a delightful and pleasant stay in our lush hotel. Sunday was originally used as the main power station of the whole village as well as an ice-factory. In 1974, the property changes its use; the ground floor becomes a pastry shop, and at the first floor, a few rooms are available for rent. A year later, the second floor is added, and since then the property is the well-known Sunday Hotel.